Neue Thatsachen über die Hautsinnesnerven. Goldscheider, Johannes Karl August Eugen Alfred, 1858–1935. Leipzig : Veit & Comp., 1885. Journal : Archiv für Physiologie ; suppl. vol. Description : 1–110 p., [5 l.] pl. ; illus: 8 phot. figs., tbls., lith. ; 24 cm. 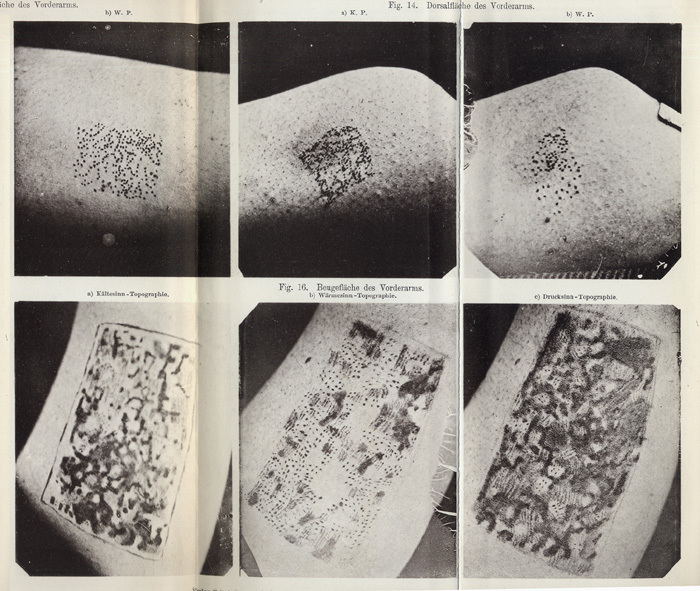 Photographs : 8 images of skin tests — collotypes on 1 printed and folded leaf. Photographer : Römmler & Jonas (Dresden). Subject : Skin — Sensitivity ; thermoreceptors. Author caption: Von Dr. Alfred Goldscheider, Assistenzarzt im Eisenbahnregiment. Medical degree, Royal Friedrich-Wilhelm Medical-Surgical Institute, Berlin, 1881. Medical officer, German military, 1881-88. Director, Moabit Municipal Hospital, 1894. Adjunct professor, internal medicine, Berlin, 1907. Full professor, internal medicine, Berlin, 1919-26. Director, University Polyclinic, Berlin, 1910. Goldscheider test—measurement of skin sensitivity with a sharp, heated rod. Abstract (1884): "Die specifischen Functionen der Nerven der Haut," Vrtljschr. f. Dermat., xi, 313–316. Index Medicus: 11301141530, 21105441590, 21701291300. In a paper titled, "Nuove osservazioni sul senso termico," Alexandre Herzen (1839-1906) described a series of experiments by which he adduced the existence of two separate neural pathways, one for conducting the sensation of heat, and the other for cold (La Sperimentale, 1879). The prevailing view at the time was that the nerves in the skin were uniform in function. Four years later, Herzen's theory was proven by Magnus Gustaf Blix (1849-1904), a Swedish physiologist whose precision with the rheophores of a DuBois-Reymond induction coil is credited for the discovery of discrete dermal thermosensors — specialized nerve cells that respond either to heat or cold stimuli. Goldscheider, unaware of Blix's research, published the same discovery, but with original insights and highly accurate maps and tables that account for a much more robust paper. 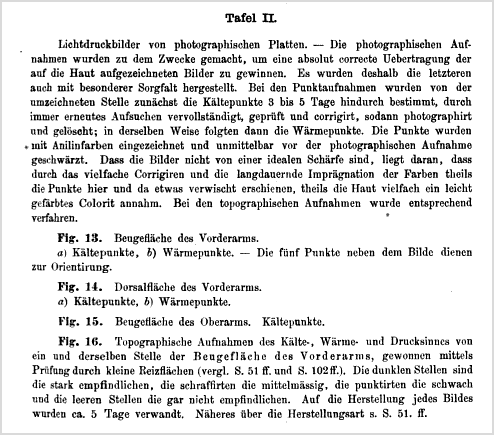 The observations of Blix and Goldscheider were confirmed by the German neurologist, Albert Eulenburg (1840-1917), who presented his report to a session of the Berlin Physiological Society on December 12th, 1884. Eulenburg was a prolific inventor of electrical and mechanical instruments that he used in his many physiological investigations, to wit, a thermaesthesiometer for measuring the skin's ability to discern differences in temperature, and a baristhesiometer for measuring the skin's sensitivity to pressure. A third scientist who stumbled upon the discovery of neural thermosensors was Henry Herbert Donaldson (1857-1923), a PhD candidate at the Johns Hopkins Psychophysical Lab directed by Granville Stanley Hall (1846–1924). Donaldson learned of Goldscheider's research through a translation of Eulenburg's report.